Spaghetti squash is a quick and easy noodle substitute that I absolutely love so I wanted to share how to cook Spaghetti Squash in the Instant Pot. When my mom is here visiting, I like to cook up a couple of these squashes so that we can enjoy them in place of spaghetti noodles. They are also yummy eaten with just butter, salt, and pepper. I have cooked spaghetti squash in both my oven and microwave, so if you’ve done that and liked it, I think you will really appreciate the quick process when you use the Instant Pot or another brand electric pressure cooker. Keep in mind that the pressure cooker needs about 10-15 minutes to build up the pressure, 10 minutes to cook the squash, and a few minutes to release the pressure. So it’s still about a 30-minute process but a completely hands-off one! 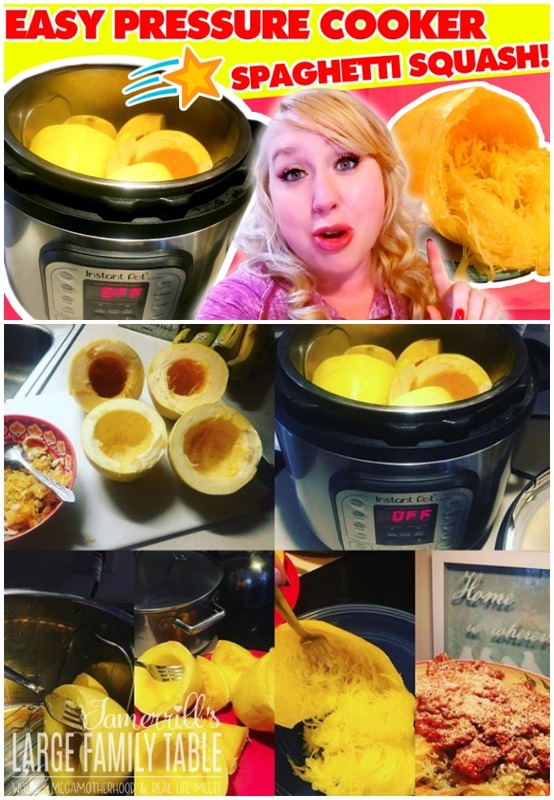 Let me show you how easy it is to cook Spaghetti Squash in the Instant Pot. A great low-carb substitute for noodles, whether they’re sitting under some kind of yummy sauce or just in a bowl with butter, salt and pepper, and parmesan cheese. Cut squash in half. Remove seeds with a spoon. Place steam trivet in pressure cooker. Add one cup water to pressure cooker. Place squash pieces in pressure cooker. Set IP on Manual for 10 minutes. If you want to cook 2 squashes at once, just cut the second one into smaller pieces and tuck them in around the larger pieces. I did this the last time my mom was visiting and they all cooked up perfectly! Click here to watch the full How To Cook Spaghetti Squash in the Instant Pot | Electric Pressure Cooker Recipes vlog!